CINCINNATI -- The Ohio Democratic Party filed a complaint Friday against anonymous flyers circulating throughout the city, including one that labels Mayor John Cranley's policies as "racist." 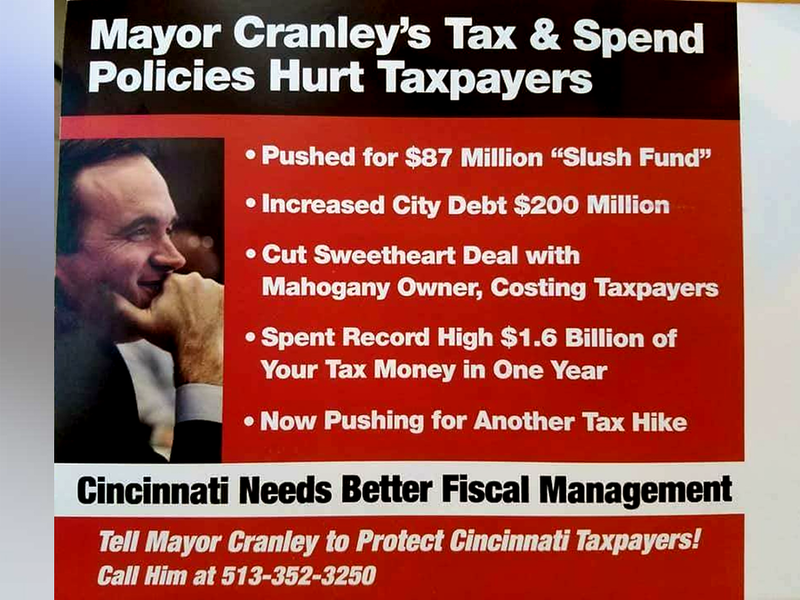 Just days before the election, several flyers have been mailed or handed to prospective voters that accuse Cranley of being "weak on crime" and "bad with the city's money." One also accuses him of targeting black leaders and senior black women leaders in the community. Hurling insults in campaign literature, a week before the election, is nothing new. But what is unusual about these flyers is that they do not say who created or paid for them. "The flyers are an egregious violation of Ohio law and something that looks to be unprecedented in a Cincinnati mayor's race," Ohio Democratic Party chairman David Pepper told WCPO. "We'll be filing a complaint with the Ohio Ethics Commission to identify who is behind them and be sure they are held accountable." Violating state election law is a first-degree misdemeanor that is punishable by up to 180 days in jail and as much as a $1,000 fine. An attorney for the Ohio Democratic Party filed the complaint against Baise Quality Printing and Graphics in Columbus, which printed the mailers. The complaint also named Pierce Communications, a Columbus company that works on political campaigns. The complaint names 10 others, listed as "John Doe," because it's still unknown who bought and created the ads. Troy Baise, the owner of Baise Quality Printing and Graphics, told WCPO he simply printed and mailed the flyers. Baise has been in the business for more than 30 years. "Everything was already made," Baise said. "All I did was print it and mail it. He asked if he could use my permit. I've been in business for 30 years, my name is on the building, I've never had any problems." Baise said Pierce Communications made the purchase. Gene Pierce, the owner of the company, did not return a call for comment. Pierce Communications does advertising work for Republicans across the state. Locally, it has worked on outgoing City Councilman Charlie Winburn's campaign. He paid Pierce more than $67,000 in 2013 for ad work on his council re-election campaign, city records show. Winburn had "nothing to do with (the flyers)," his spokesman Jacob Hesseling said. Pierce Communications worked for me and Murray in the past and I must say if He sent out Cranley Flyer it is legal in contrasting Cranley! Cranley told WCPO Thursday that he's not sure where the flyers bearing these accusations are coming from, but he knows where they're appearing: In voters' mailboxes and Cincinnati street corners in bright red, black and white. "This is the worst of politics," Cranley said Thursday. "It's outrageous." 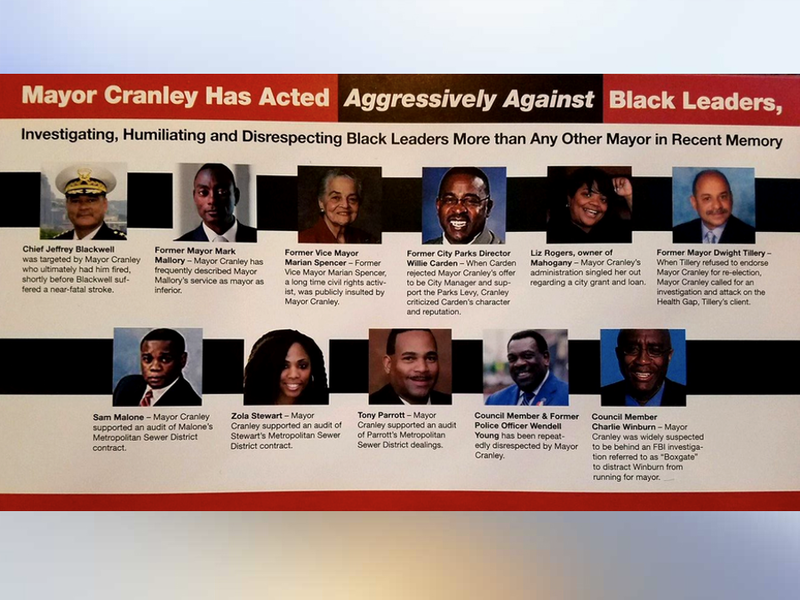 The full-color mailers criticize Cranley's financial leadership and claim he has "acted aggressively against black leaders" such as ex-police chief Jeffrey Blackwell and Councilman Wendell Young. Hamilton County Democratic Party Chairman Tim Burke questioned the legality of the flyers because they do not identify who funded or created them. "If you distribute campaign literature, you are obligated to identify yourself," Burke told WCPO. Although many of the flyers use a screenshot of a WCPO story about Blackwell's firing and include the logo of USA Today in an upper corner, neither organization is involved in their creation or distribution. Neither, according to campaign manager Amanda Ford, is Cranley's mayoral opponent, fellow Democrat and Councilwoman Yvette Simpson. In a statement, Ford denied any involvement with the Cranley flyers and cast aspersions on past pro-Cranley ads. "With 5 days until the election, we are determined to keep our campaign positive, energized, and people powered. For weeks, our campaign has been the subject of numerous false, misleading, and negative print and television ads financed by our opponent's former campaign manager's dark money PAC. These ads have attacked our candidate's integrity, character, and questioned her commitment to our city and our children. Where was the outrage and questions when these ads were directed toward our campaign? We have now been asked to respond to negative ads directed at our opponent. These ads are in no way associated with our campaign, and we have no knowledge who is behind them. Media outlets have asked us to respond to these ads, but have not similarly questioned our opponent about the negative ads by his former employee. From the beginning, our campaign has been committed to improving the lives of all Cincinnatians; we will continue to run a positive and truthful campaign." Councilman Christopher Smitherman said legality is the issue at hand. The flyers don't include any information about who paid for them, which is illegal whenever materials are produced at a cost of over $100. "People are entitled to have strong opinions, especially in elections," Smitherman said. "But if you're going to pay to produce a piece -- and somebody's paid to produce what's a pretty high-quality, multicolored niece -- they have to, by law, identify it." Smitherman said he went through something similar in 2013, and seeing it happen again makes him angry. "This is a tactic in order to confuse voters, lie to them and have them stay home and not participate in the political process," he said. WCPO's Evan Millward contributed to this report.